The Santa Monica Public Library and the Santa Monica History Museum present a joint exhibition showcasing the work of early Santa Monica photographers. From March 9 - June 15, 2019. A portion of the exhibition will be on display in the lobby of the Main Library and part will be on display next door at the Santa Monica History Museum. In November 1890, Santa Monica town trustees accepted a donation of 800 books, forming the foundation for the nascent town library. On December 10, Elfie Mosse was appointed City Librarian. Located at Oregon Ave. (now Santa Monica Blvd.) and Third Street, two rooms in the Bank of Santa Monica building were set aside for the library. For the first 14 years, Elfie Mosse was the only staff, and she would lead the library until 1939. Since those humble beginnings, the library has grown to become a system of five locations and over 400,000 volumes in the collections. Santa Monica Public Library offers a wide variety of programs for people of all ages and engages in a lively online presence. Much has changed in 125 years, but the tradition of service remains our cornerstone. 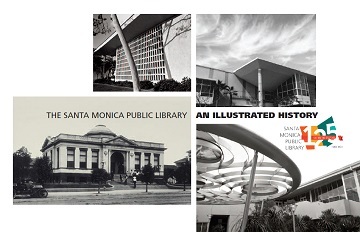 The Library’s digital collections include the Image Archives of the Santa Monica Bay area, a collection of photographs and postcards dating from 1875 to the present; historical maps of the Santa Monica area; the years 1875 to 1936 of the Santa Monica Evening Outlook; the Santa Monica Newspaper Index, a selective index to newspaper and magazine articles of local interest dating throughout the Twentieth Century and up to the present. Search the Santa Monica Image Archives and Palisades Historical Image Collection on Calisphere, a service of the University of California Libraries. The Marcus O. Tucker Collection highlights the achievements of "Black Men of Courage" with a collection of biographical resources. View the list of books and media in the Marcus O. Tucker Collection. Los Angeles County Superior Court Judge Marcus O. Tucker, Jr. was born in Santa Monica, California, on November 12, 1934. Tucker graduated from University High School in Los Angeles in 1952. Tucker attended Howard University Law School, where he earned a J.D. in 1960 and in 1997 earned an MA. in Criminal Justice from Chapman University. Returning to Santa Monica, Tucker served from 1963 to 1965 as the first African American deputy city attorney followed by private practice, appointment to the Long Beach Municipal Court, and subsequently the Los Angeles Superior Court. An honoree of the National Bar Association Hall of Fame, Judge Tucker passed away in Long Beach on August 8, 2015. Biographical information excerpted from The History Makers and Long Beach Press Telegram, August 10, 2015. The history of the Main Library and the four branches: Ocean Park, Fairview, Montana Avenue and Pico Branch. Special collection containing books and documents on the history of Santa Monica and greater Los Angeles areas. The new Main Library is graced by a cycle of murals created by artist Stanton Macdonald-Wright in 1935 for the former Main Library located at 503 Santa Monica Blvd. Located on the Main Library campus at 1350 7th Street, the Museum showcases the unique history and qualities of the City. Since 1975, the Museum has collected and preserved the history, art and culture of the Santa Monica Bay Area. Many of the Museum's historical photographs can be viewed online. FamilySearch is a nonprofit family history organization dedicated to connecting families across generations. They preserve and share the largest collection of genealogical and historical records in the world. Setting up an account is free. It includes many older Santa Monica City Directories.